The following links will assist faculty with a variety of academic process and link to necessary forms to complete these tasks. The Andrew Young School of Policy Studies has available for use by faculty, staff, and students a variety of conference rooms, computer labs, and seminar rooms. These rooms can be requested for use by filling out the room request form. A confirmation will be sent to you via email. The use of the rooms are limited to Monday-Friday 8:00 am to 6:00 pm. Only under special circumstances will evening and weekend use of the space be granted. Facilities maintenance and building problems and issues can be reported to the Dean’s Office to Ms. Gayon McFarquhar-Johnson, facilities coordinator at 404-413-0055 or via email at gayon@gsu.edu. The Andrew Young School of Policy Studies has a variety of templates that can be used by faculty, staff, and students for presentations and submission of documents. Georgia State University has a variety of different logos that can be used officially. To request these, please see: http://commkit.gsu.edu/guidelines/visual-identity/. To request official logos of the Andrew Young School and of its departments and centers, please contact Ms. Jennifer Giarratano, Public Relations Manager at 404-413-0028 or via email at jgiarratano@gsu.edu. To request U.S. News & World Report’s Best Graduate Schools digital logos, please contact the PR Manager at 404-413-0028 or jgiarratano@gsu.edu. Must be familiar with mandatory usage guidelines. In 2014, President Mark Becker announced that the Andrew Young School of Policy Studies and the J. Mac Robinson School of Business would be moving to the newly acquired 55 Park Place Building. Both colleges had maximized their current space on campus, and moving to 55 Park Place would allow for the programs within the colleges to expand and flourish. 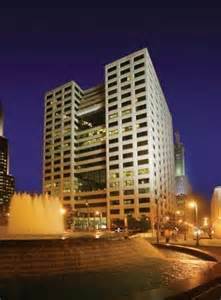 The Andrew Young School of Policy Studies appointed a College Space Planning committee to work with Consultants, Cooper Carry, hired by Georgia State University to program and develop a stacking plan for the college in the allocated floors of 55 Park Place. Please see document below related to space planning for the college in the 55 Park Place building.